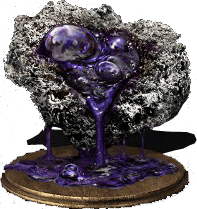 Poison Gem is an Upgrade Material in Dark Souls 3. A gem of infused titanite. Discovered in the rotted forest of Farron. Used in infusion to create poison weapons. Such weapons inflict poison-laced damage that gradually eats away at foes. Found on the corpse guarded by three Elder Ghru to the left of the Keep Ruins bonfire. Found in the toxic swamp, inside the cave, in Profaned Capital. Requires the Farron Coal in order to start infusing weapons. The effect of poison infusions on long spears' Charge weapon art is still under investigation. Help required. Can be farmed at the Keep Ruins bonfire, by killing the three Ghru Grunts right next to the bonfire. Go back to DS2 poison gem, shoo shoo, go back with your friend the spotted whip. it increases the bleed effect on weapons that already have the bleed effect like claws katanas warden twinblades ect. So I&apos;m a sorceres/miracle worker and I just got enough dexterity to use the brigand twindaggers, I was going to put the Crystal gem on it because of my high intelligence, but I feel the poison gem would be better because it&apos;d make a quick poison build up, which should I use? Am i the only person who sees the great value in poison weapons for their ability to essentially negate tears of denial? The thrall in the dreg heap that has a poisoned Flamberge can also drop these. The other ones might be able to, but I&apos;ve only gotten one from that one. Poison can now be applied to enemies very fast now, good for bosses and tanky enemies to apply to at the start and then switch to your primary weapon. poisoned katana? you have bleed and poison? it is a theory..
Its called Elder Ghru. I&apos;d fix it myself but too lazy. When I went to enchant my +10 Uchigatana I hovered over poison Gem and saw it upped my Bleed value by one as well as adding a poison value. Can anyone Confirm this? I just started dark souls 3 im up to the road of sacrifices. My best weapon is four pronged plow and im wondering whether to infuse poison on it since i adored posion in dark souls 2.Any advice on poison or farron keep would be appreciated. Just don&apos;t use it as main form of offense. infuse your side weapon with poison, apply it and swap to your main weapons. Poison in other Soul games was at least useful in PVP. But in DS3 I don&apos;t see it as being practical unless there is a way to stack/buff poison damage. Until then poison builds are not going to be a thing in the game. While enemies are poisoned, you can always see their health bars. But, yeah, if you only care about damage, yes, Poison is useless. Yesterday I infused my Caestus +2 with poison and even though I poisoned some monsters with 2 hits (several enemies seem to be immune to poison at all) it did 3 HP per second of damage, which is pretty useless considering that I do around 60 DPS per second by hitting with the weapon. If anyone can share your thoughts/experience that would be great. I am not sure if this applies to all poison weapons, however when infused with the Rotton Ghru Spear the effects seemed to be unnoticeable.